Now this is a truly attractive book. One of those coffee table type books dripping with gorgeous National Geographic quality photos, or maybe Smithsonian quality – and all about metal and gold objects. Besides being a beautiful book full of superb color pictures it is crammed with accurate ethnological information about who did what, when and where. It is good enough to function as a textbook, in fact I’d call it the definitive book on the subject, or at least the most interesting and entertaining one, combining good factual, scholarly writing with enough juicy photographs to satisfy anyone wanting to add something impressive to their library of jewelry books and related subjects. The book appears academically sound, each item cataloged with a good art historical and ethnological note at the end describing the meaning, origins and references of the object. I enjoy this kind of thing myself, learning more about a culture than merely looking at a pretty picture of a gold object. One is in fact not used to having an academically solid book that also looks pretty and has great quality photographs. It doesn’t have that utilitarian ‘textbook’ look to it and has instead a sumptuous feeling. 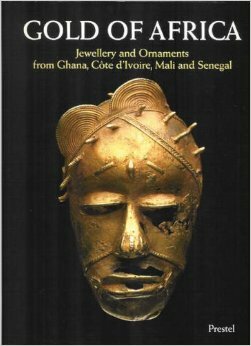 Chapters include a discussion of the use and history of gold in Africa, the Sahara, Sahel and Senegambia, the Akan of Ghana, the Akan – related peoples of Côte d’Ivoire, the gold mines of West Africa and goldsmiths and their technology. There are over hundred full color photos of exquisite examples of gold work. The technology used is shown in good photographs, a smith hammering out a very large earring from a single piece of gold, beeswax workers creating incredibly intricate swirls of uniform beeswax wire for lost wax casting. It seems that goldsmiths in Africa are often linked with blacksmiths almost everywhere gold is worked. Along the southern edge of the Sahara (the Sahel) goldsmiths hammer their work out of solid lumps to obtain the very large, solid ‘boat-like’ gold earrings worn by their women. But they do very little lost wax casting. The further south you go from here the more lost wax casting there is until finally almost all work is cast in some regions. The quality of the casting will surprise people who assume that high technology is the only way to cast fine detail. The filligree work pictured rivals the best in the world, fine granulation and wire solderings producing incredibly complex patterned surfaces. There are numerous photographs too of Baule gold leaf work where a gold foil has been applied to carved wooden objects, often speakers staffs or fly whisk handles. All these photos are really wonderful quality, careful side lighting to pick up surface detail, warm, glowing studio photographs showing the best of the objects pictured. Baule bead necklaces are unique collections of finely detailed gold beads in simple shapes, rectangles, circles, things like fine-toothed buzz saws all in thread-like textured wires of gold -somehow very modern looking, quite contemporary in Western terms, though centuries old in African ones. This is a book to return to over and over, to read slowly and to study the rich images over time. Another winner, I recommend this book to anyone who likes gold, history, Africa, ethnology, design, ancient technology or just enjoys looking at beautiful pictures of fine gold objects. For the gift givers amongst you anyone with a liking for jewelry or metalwork receiving this book would be one happy camper. It is 248 pages long with 225 illustrations 196 of which are in color.